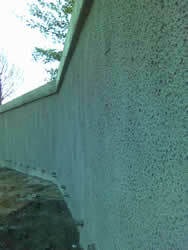 The most common use of sprayed concrete in the civil engineering industry is the facing of piled walls. 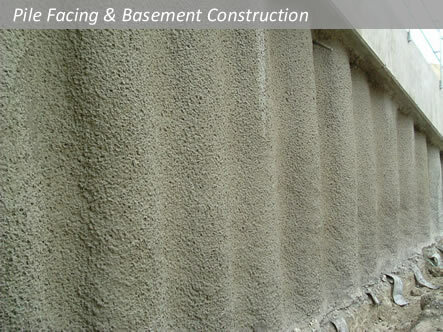 The sprayed concrete process is ideally suited for the construction of single sided basement walls that have been formed using either Secant or contiguous piles. 2. Filling of pile cusp and 50mm facing to pile face to provide uniform appearance following pile contours. 3. 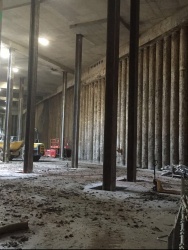 Filling of complete pile cusp to produce flat structural basement wall. The facing walls can include all types of mesh or loss bar reinforcement, depending on the design criteria and hydrostatic/earth loadings imposed on the liner wall. The sprayed concrete process ensures that dense concrete is applied to the underside of the capping beam, which is usually a problematic area when casting concrete walls. If required, hydrophilic water bar can be incorporated into the structure at the wall/ floor joint and wall capping beam joint. 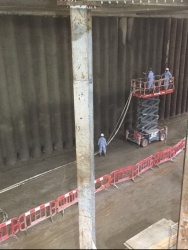 Water proofing admixtures can also be included within the sprayed concrete mix. There are also a number of finishes available which can lead to cost savings.